Is it the classic tailoring, or the symbolism of action and purpose? 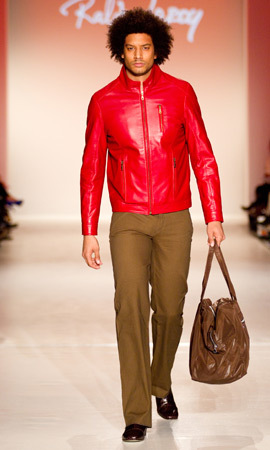 Either way, for fall-winter 2010, the Ralph Leroy collection drew upon the best of both worlds in rich wools, tweeds, and leather. Starched shirts with sharp collars are smart without fuss when paired with easy slacks in earthy tweeds and light plaids. Turned-up cuffs reveal fun shots of colour in fuchsia and blue, but the real colour displays are saved for the outerwear. Jackets and coats in leather and wool showcase this young designerâ€™s talent, evident in such pieces as the long, safari-style coat in midnight blue. Softening the shiny military-esque buttons with shawl collars and contrasting trims, the simple silhouettes transform stuffy uniforms into everyday chic. A favourite piece is the leather jacket with a massive hood, a flamboyant way to conceal your identity. With vermillion, heathery grey, teak, and a shot of marigold, this Montreal designer shows a multitude of ways to be a stylish man on a mission. To see a non-black collection for this fall is nevertheless a welcome shock to the system.